Island-building isn’t new. San Francisco built Treasure Island in the 1930s for the Golden Gate International Exposition. Miami’s exclusive Star Island was constructed by the Army Corps of Engineers back in the 1920s. And of course there are more recent examples, such as Dubai’s infamous Palm Islands. Photo courtesy of Asia Maritime Transparncy Initiative Chinese development at the newly reclaimed Fiery Cross Reef, which lies on the west side of Spratly Island. China’s island-building boom is widely seen as an attempt to tighten its control over the South China Sea. Now, China is fervently adding to that list at an unprecedented rate. For the past 18-plus months, China has been “reclaiming land” in the Spratly Islands, an island chain that consists of more than 200 identified reefs, atolls, islands, and islets in the South China Sea. A half-dozen nations make territorial claims over the strategically important area, and China’s island-building boom is widely seen as an attempt to tighten its control over the South China Sea. So far, China has completed the construction of five islands and continues work on two more. So, what does it take to construct an island chain in the middle of the ocean? It involves massive dredging of sand and corals, dumping sand on top of submerged and partially submerged reefs, and constructing giant concrete seawalls to protect manmade structures. 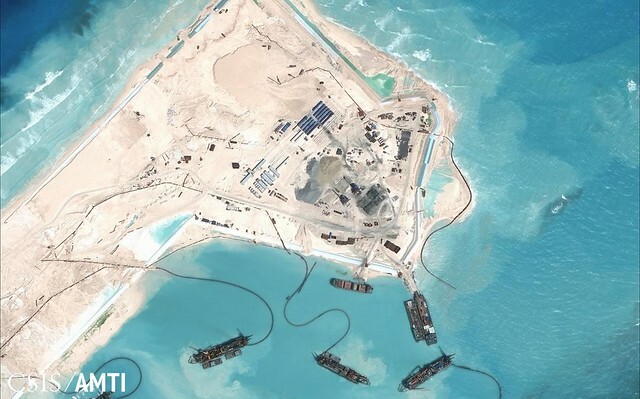 China is topping its fully “reclaimed” islands with helipads, airstrips, military support buildings, solar installations, wind turbines, concrete plants, and radar towers, while also adding on harbors, piers, and desalination pumps. In other words, China is burying reefs under sand and concrete. This would be troubling in any context, but it’s especially worrisome in the Spratly Islands. The reefs there happen to represent one of the most ecologically significant marine environments in the world, providing habitat for diverse marine life, including endangered species and larvae of heavily depleted fisheries in the South China Sea. Dr. John McManus, a professor of Marine Biology and Fisheries at the University of Miami who has spent decades studying the Pacific, points out that in addition to the actual reef burying, several other activities are similarly troublesome, especially dredging. China has dredged massive areas to provide sand for island-building activities and to create deep channels to facilitate boat access to and from the islands. The scale of China’s island-building activities is unprecedented for the region. Although several other countries — including Vietnam, Malaysia and the Philippines — have undertaken some land reclamation activities, Gomez says they have reclaimed less than 100 acres of land, combined, over the last several decades. In comparison, in May the US Department of Defense estimated that China has reclaimed more than 2,000 acres in the previous 18 months. This estimate does not include the acres and acres that have been impacted by dredging. Much of the damage to the seven impacted reefs may be permanent, but a freeze on ocean filling could go a long way to protecting the remainder of the Spratly atolls and islets.